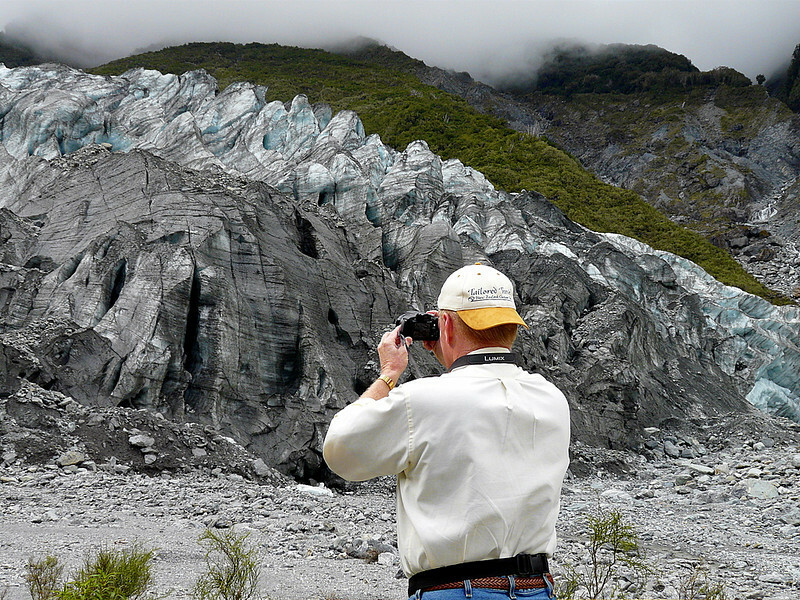 For a close-up glacier experience, nothing beats the convenience of Franz Josef and Fox Glacier on the South Island of New Zealand. You don’t have to board a ship for a long cruise to the glacier’s face, simply park your car in the parking lot and start walking. Active travelers choose between moderately easy walks to view the glaciers, visits by helicopter that deposit you onto the ice or adventure company treks where well-equipped guests—think ropes, crampons and ice axe—provide the ultimate glacier visit. When Alan and I traveled to Westland Tai Poutini National Park with Robert Panzer of Tailored Travel, we opted for walks that introduced us to the glaciers, providing plenty of dramatic photo opportunities. 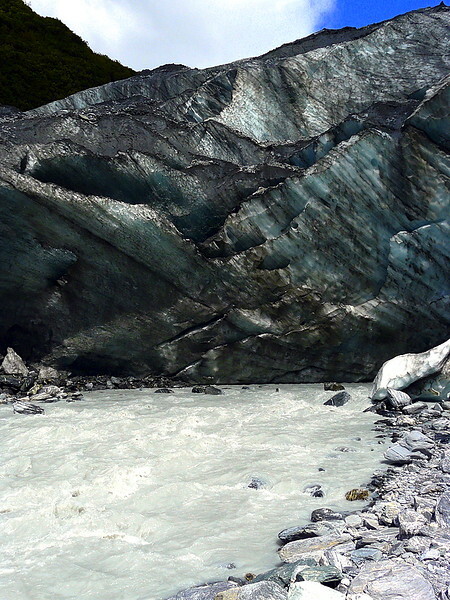 The gacial runoff from Franz Josef is a milky white color. The path to Franz Josef glacier leads from the parking lot through a temperate rain forest’s tree canopy to a dry riverbed. Here, the way becomes rocky, with multiple, small streams to cross. A rope barrier blocks the path near the glacier’s terminal face. The accompanying sign urges visitors to stay safely behind the rope although many ignore it. Ask Alan. 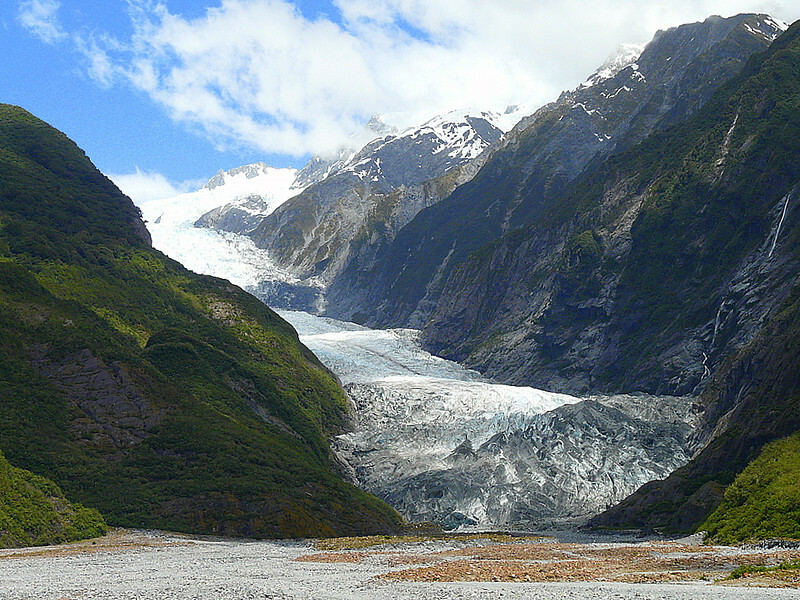 Approximately 15 miles up the road, Fox Glacier offers several short walks. We chose the trail from the parking lot that stays above the riverbed. Although steeper, Alan and I found the Fox Glacier Valley walk to be easier than the one at Franz Josef, but with a more rugged feel to it. At the trail’s end, we were within 130 feet of the glacier’s jagged piles of ice. With so many hiking, glacier walking and heli-tour opportunities, a visit to New Zealand’s glacier country will keep boomer travelers busy for days. And don’t forget to hike the trails of Lake Matheson, while you’re in the area. For accommodations in New Zealand Glacier Country, we chose Franz Josef Country Retreat, about five miles outside the village of Franz Josef. The luxury boutique bed and breakfast hotel is located on land that’s been farmed by Marie Coburn’s family for the last 100 years. Update, November 5, 2012: Franz Josef Country Retreat website is no longer live. After much searching on Google, I could not determine if they are still in business. 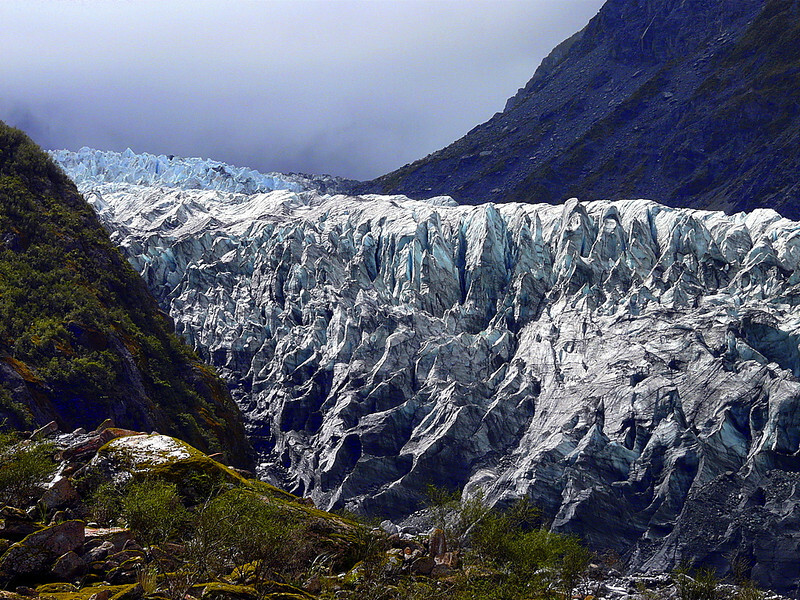 Have you visited Franz Josef and Fox Glaciers? Did you take a glacier trek? Join the conversation at the My Itchy Travel Feet page on Facebook or send us an email.